We only live about an hour from Palm Springs, making it ideal for a quick getaway. Our favorite hotel is the Colony Palms Hotel. (Although I must admit we have yet to try all the hotels in Palm Springs.) 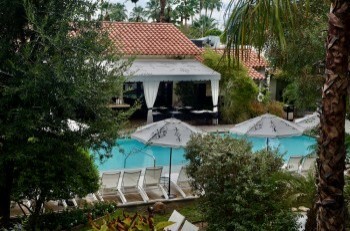 We love the Colony Palms for lots of reasons: its character, charm, serenity, chic décor, and friendly staff. We particularly enjoy its secluded location in the heart of Old Palm Springs—an historic neighborhood famous as a celebrity retreat in the 30s and 40s. 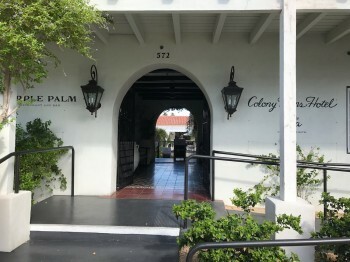 If you were a star like Frank Sinatra, Rita Hayworth or Clark Cable and wanted to get away from the bustle of Hollywood, the Colony Palms—built as a speakeasy and saloon in 1936 by notorious Purple Gang Mobster Al Wertheimer— was one enticing place to go. Many years later, it’s still a perfect getaway. We especially love the Colony Palms because of the Purple Palm Restaurant and Bar, the outstanding restaurant on the hotel’s property. The Purple Palm is a destination in itself, even if you aren’t staying in the hotel. Let’s first focus on the restaurant. (After all, when you write about food as we do, food comes first.) After we had checked into our lovely room, sipped a bit of Rosé, and noshed on a delicious cheese platter left for us, we wandered over to the restaurant, which is picturesquely set at the edge of the pool that was sparkling in the late afternoon sun. It was a hot September day so Todd took a dip in the pool while I sat at the pool’s edge sipping an icy Mojave Mule concocted by the Purple Palm bartender. This tangy drink, made with vodka, lime juice, bitters, peaches and ginger beer, hit the spot and cooled me off along with the soothing spray from surrounding misters. The Purple Palm is known for its inventive cocktails and this was certainly a good one. Soon we met with the restaurant’s friendly manager, Allen Canarutto, who described the updating that has recently taken place at the Purple Palm. We knew there had been changes since the last time we visited, but we couldn’t quite identify them since the restaurant still has the character and ambiance we loved. 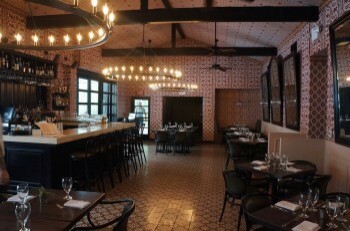 Allen pointed out that the banquet seating along the walls had been removed and the chandeliers replaced, making the intimate restaurant seem a bit more spacious and allowing more flexibility in table arrangements. Allen recommended several more cocktails that were new to the menu since our last visit and we enjoyed them. I savored the Doll Squad made with vodka, grapefruit, Cappalletti (a wine-based aperitif, sweeter than Campari), and Cocchi Torino (a popular, upscale vermouth). This was a subtly flavorful drink with a nice amount of zest. The restaurant is now barrel-aging its own whiskey so Todd sampled the Booklegger made with Kentucky white whiskey, Cocchi Torino, and cherry bitters. Later we shared a long-time favorite cocktail on the Purple Palm menu — the Purple Rose, created with Rosé wine, St. Germain, lemon juice, blue curacao, and prickly pear puree. I could imagine sipping this refreshing drink while lounging around the pool. Our palates whetted with luscious cocktails, it was now time to eat. First we learned about the Purple Palm’s Executive Chef, Nick Tall (photo right), who has been at the restaurant for about two years. He was formerly the Sous Chef at the highly acclaimed restaurant, Amber, at the Mandarin Oriental in Hong Kong. 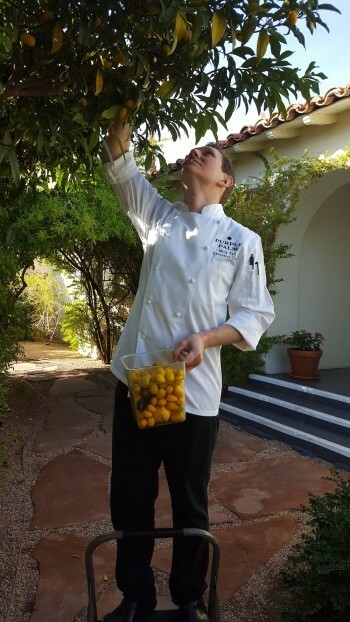 His focus with his globally influenced American Cuisine at the Purple Palm is using fresh, local and organic ingredients whenever possible. He has his own garden on the property and creates his changing dishes around what is available at nearby farmers’ markets. An example of one of Nick’s innovative dishes was the Pan Roasted Salmon, which we loved. 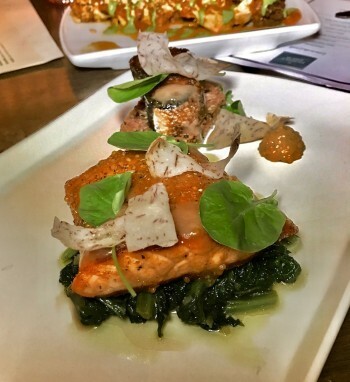 It was served with crispy taro (a root vegetable), watercress, lavender and mustard, but the creative touch was house-made smoked salmon sausage wrapped in crispy salmon skin. We also tried several small dishes that are designed to share. The Kinilaw Ceviche was tangy and delicious with fresno chiles, tomatoes, onions, cilantro and, surprisingly, coconut milk which gave it a mellow, creamy flavor. We savored the Braised Lamb and Chinese Green Beans with lemongrass and a tomato chili sauce, but our favorite dish was the Duck Dumplings prepared with shiitake mushrooms, garlic, chives, ginger, oranges and chile oil. These are just a few of the many tantalizing dishes available on the imaginative menu at the Purple Palm. The restaurant also has an extensive, appealing wine list and craft beer list. 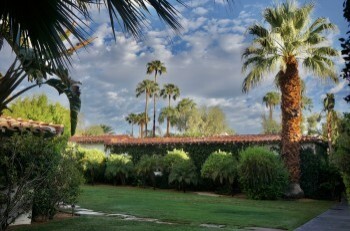 The grounds at the Colony Palms have recently been updated and are beautifully landscaped. There are a variety of secluded, charming spaces for private parties where the Purple Palm can provide food. The hotel is a popular spot for special occasions from weddings to birthdays and anniversaries or just about any private event for family and friends. It was especially nice to saunter off to our nearby room after the cocktails and dinner at the Purple Palm. The rooms have also been updated and are stylish but comfortable. Each room is individually decorated with striking, unique artistic touches. 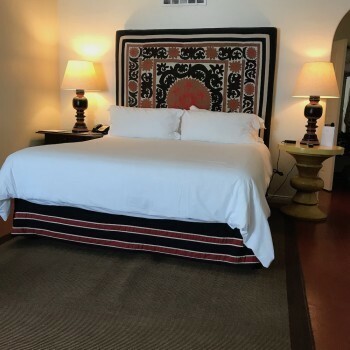 It was so nice to slide into the lovely linens and we were tempted to light the fireplace in our cozy room even though it was a hot night in Palm Springs. Each room has every amenity you could desire, plus a full bar. After this recent visit, we are more convinced than ever that the Colony Palms is the perfect romantic retreat. Once you arrive, you can wander around the winding paths enjoying the lush green plantings, sip refreshing libations by the pool, and enjoy a delectable dinner at the Purple Palm. I guarantee sweet dreams. 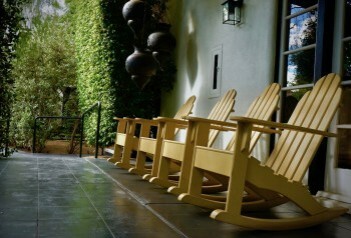 For reservations at the Purple Palm, which is open for breakfast, lunch or dinner, call 760-969-1818. A wonderful Sunday brunch is also available. Go to the Purple Palm's website at for more information. For reservations at the Colony Palms go Colony Palm's website. 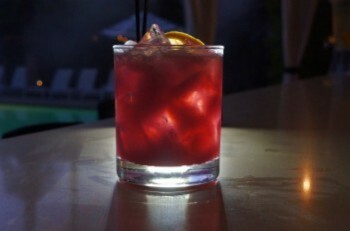 Photos taken by Todd Montgomery (except for Chef's photo, courtesy of Purple Palm).